Grab your camper and the all new OnePassNZ and hit the road for the ultimate South Island ski or snowboarding adventure. 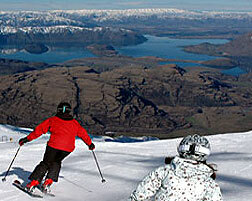 Experience the best of South Island NZ Skiing with this unique holiday idea. Grab your campervan, complete with a fan heater to keep you warm at night! You will also need the all new OnePassNZ - a ski lift and adventure pass valid at 8 resorts and for loads of other fun activities. Check out the pass details here. A campervan is a top way to get around with transport and accommodation all in one, and there are lots to choose from. Make sure you get one with a heater included - as nights can be chilly. A warm sleeping bag and dinner at the local pub should keep you warm! Set out from Christchurch on this epic adventure and head to Porters Ski Area, a local favourite with plenty of beginner slopes to ease into it. Advance to their steeper stuff, or move south to MacKenzie Country, near Lake Tekapo. Here you will find the hidden gems of Ohau, Mt Dobson and Roundhill Mountain, which boasts Australasia's high lifted point at 2133m and the world's longest tow lift. It's worth the ride for the huge expanse of open slopes and (hopefully) fresh powder to be found. If you need a day off from all the awesome skiing, you can exchange your daily pass for Snow Dollars and cash in on other activities like the Oamarama Hot Tubs or a Helicopter Ride over the extremely scenic mountain region. When you have experienced the best of MacKenzie Country, head south 2 hours to Wanaka, one of New Zealand's most chilled out and picturesque towns. If you were not already having fun, its about to begin with the likes of Treble Cone, Cardrona and SnowParkNZ on your doorstep! By now, you will have accessed over 2230 hectares of ski terrain, NZ largest amount on one lift ticket. There is plenty of other activities in Wanaka, such as scenic flights, jet boating, rafting and even a dinner at the Lone Star available all on your OnePassNZ.